President Obama talked with Dr. John Holdren, then his science adviser, in November 2010. Holdren, a professor at Harvard University’s Kennedy School of Government, is concerned that President Trump still hasn’t named a science adviser. CAMBRIDGE — When the Ebola virus began sweeping through West Africa four years ago, killing thousands of people and threatening to spread beyond the continent, President Obama turned to his science adviser for options. Presidents before him have sought the counsel of White House science advisers to build atomic weapons, seek cures for cancer, and devise policies to oversee research into stem cells, cloning, and the human genome. President Trump, however, appears in no rush to follow suit. More than a year after taking office, Trump has yet to appoint a science adviser — longer than any other president since World War II, when Franklin D. Roosevelt created the position to receive technical, apolitical advice. His failure to fill the prominent post, which has required Senate confirmation since 1976, has raised concerns among scientists throughout the country, but perhaps nowhere more than in Cambridge, where the most recent White House science adviser is sounding the alarm. A physicist, Holdren oversaw the White House Office of Science and Technology Policy, which had a staff of 135 people who advised the president through studies and briefings on subjects from climate change to nuclear weapons policy. 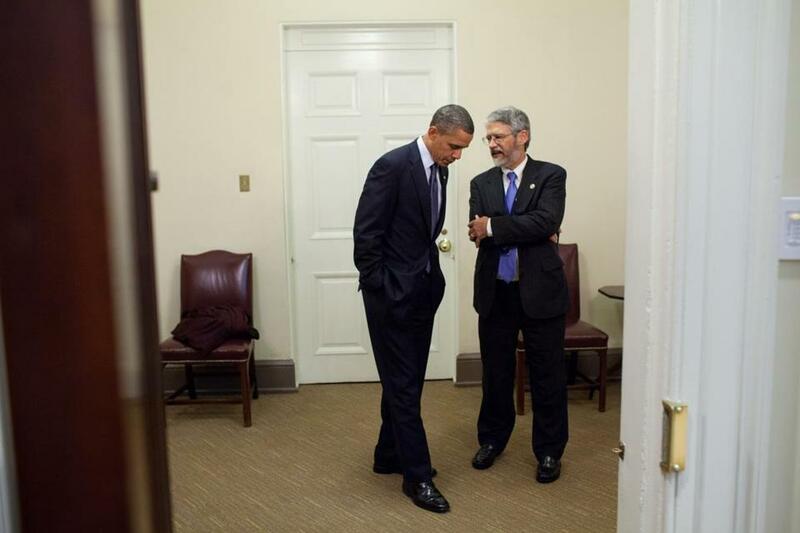 As an assistant to the president, Holdren was one of the few White House officials with direct access to Obama. That proximity allowed his staff to play key roles in helping the president navigate through complex crises, such as the 2010 Deepwater Horizon oil spill in the Gulf of Mexico and the 2011 nuclear meltdown at the Fukushima plant in Japan. Since returning to Cambridge, Holdren and many of his colleagues have grown increasingly dismayed that Trump not only hasn’t appointed a science adviser – and may ultimately choose not to – but that his administration has given such short shrift to science in general. As evidence, they point to Trump’s first budget, which proposed a 20 percent cut to the Energy Department’s Office of Science, an agency that oversees a vast amount of basic research at the national laboratories; an 18 percent cut to the National Institutes of Health; and a 31 percent cut to the Environmental Protection Agency. Many of those proposed cuts are unlikely to make it through Congress, although lawmakers have yet to approve a budget for the current fiscal year. White House officials wouldn’t discuss personnel decisions, but they said the Office of Science and Technology Policy now has a staff of just 50, far below the level under Obama. Fewer than half are scientists. An official in the office, who spoke on condition of anonymity because he wasn’t authorized to discuss the matter publicly, said the staff has spent the year preparing reports on subjects including space policy, cyber security, and nuclear energy. He also said he expects the staff will grow in the coming years. The official, however, acknowledged that the lack of a director has posed challenges. Trump is receiving scientific advice from members of his cabinet and other agencies, the official added. But other top scientists around the country warned that briefings on technical matters from cabinet secretaries and agencies are insufficient. Others said that damage has already been done. They noted that Trump has already slashed funding for clean energy research and announced that the United States would withdraw from the Paris climate accord. Some wondered whether Trump has any interest in science at all. “The most serious problems come when there is a president who willfully ignores and does not have any apparent interest in science or in seeking credible information and advice from scientists,” Holt said. For his part, Holdren is working with Holt and others to promote science and push back against the Trump administration when it takes actions or makes statements that contradict scientific findings.